We recognize the different challenges faced by youths in the rapidly changing landscape of the knowledge based economy. Competition is stiff and the pressure can be immense. There is also a need to keep up with the social media identity. To find a safe space for one to be willing to open up to share and seek support is not easy. In order to ensure the continuous well-being of youths, it is our imperative to create the safe space for them to be able to emote, seek support and relieve their stress. Circles are run like an interactive Ted Talk with introspection within a safe community to help youths support one another while building their confidence level and soft skills. Coaching can be done on a 1-1 basis or a small group basis. It is useful to help youths uncover their blindspots and increase their empathy levels as they reconnect with themselves. These are actual issues that have surfaced from youths whom we have worked with. In all instances, our Growthbeans Coaches were able to support them to uncover their blind-spots and find their solutions. If these scenarios were posted to you, how might you handle them? Individual tends to aim for perfection, and wants perfection in work and relationships with no mistakes made. No matter how good a situation is, she wants to find a way to improve it. If she makes mistakes, she will judge herself, others may judge her and she will mull over it, it will affect other areas of life, be unhappy and she may go into depression. She is now aware that she spends a lot of time on negative thoughts and considering all the things that can possibly go wrong. She wants to change it to more meaningful thoughts. How should she begin? How would you support her? "Thank you so so much for the help and allowing me to see what I have done." Individual wants to be more firm and learn to say no. When she can do that, work will be more fairly distributed and she won't end up having to do more than the fair share. Others will also learn to be more responsible. However, she tends to feel bad when and if she says no to others. She feels that in order to achieve it, she has to be more stern - and the tone in which she says it has to be louder - but she feels that this is not her character. And it might help to be in a position of authority. Where should she begin? How would you support her? "Thank you for giving me more insights to think more deeply into what is going on." Individual is currently taking a gap year and will be starting school soon. She has had a disagreement with her parents on the tertiary institution to go for which has caused her to lose her drive. She wants to work on her motivation to go to tertiary institution. In the conversation, she shares she likes to spend time with friends where she listens to their challenges but she does not share hers. She is unhappy and has thought of suicide. How might you support her? "Thank you so much for guiding me through this process. I can enter uni feeling better without this baggage weighing my heart down and I've recovered the drive to excel in my studies. It may be a normal part of your job, but you have changed my life today. Thank you from the bottom of my (lighter) heart." interested in bringing growthbeans into your institution for your youths? 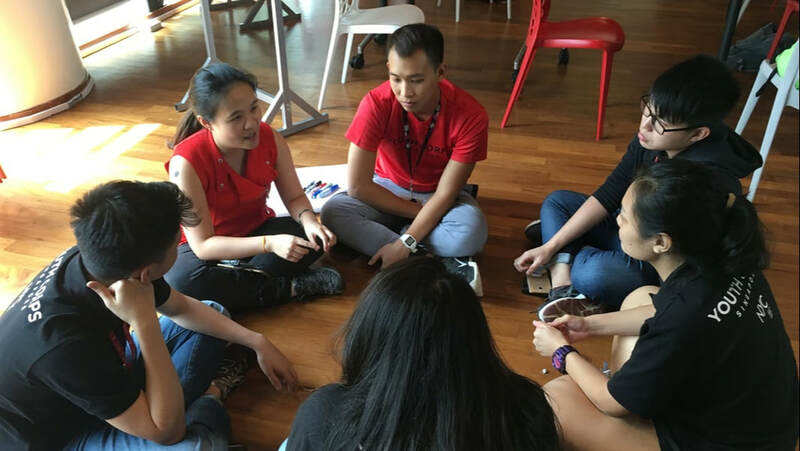 We welcome you to join us at our Growthbeans Youth Learning and Coaching Circles at Youth Corps Singapore to experience what we do.